Act-3D has released an updated (HF01) Lumion 8.0, the latest version of its real-time visualisation software, adding a new Styles system, a number of new lighting and camera options, and support for 4K video output. – Standard materials: It is now possible to switch between Waxiness and Transparency again. – Hyperlight now works as expected in Lumion (Standard). – There are no longer artifacts on Standard materials with high Weathering slider values when rendering MP4 files in 4K resolution (3860×2160). – Download the attached .ZIP file and unzip it in the Lumion 8 installation folder (Choose Extract here or whatever the option is called in your unzip application). – When the unzip app asks you if you want to overwrite the 3 existing files, simply click on the OK button. – Then restart Lumion (if it was already open). 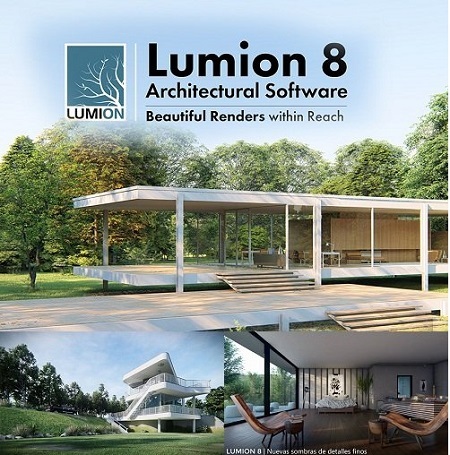 About Lumion 8.0. Act-3D has released Lumion 8.0, the latest version of its real-time visualisation software, adding a new Styles system, a number of new lighting and camera options, and support for 4K video output. About Act-3D. Founded in 1998, Act-3D B.V. is the privately owned company behind Lumion. Based in Warmond, The Netherlands. Act-3D was among the pioneers when the first 3D acceleration hardware became commonplace. After several years of experience in simulation, training, architecture, TV and film Act-3D decided to focus on architectural visualization. Our passion is to transform high end visualization technology so regular AEC professionals can use it. Act-3D software is used all over the world, we have people working for us in more than 5 countries and currently Lumion is the most popular visualization solution of its kind.